These rocket ship cookie cutters provide all the shapes needed to make your cookies into 3-dimensional shuttles, rockets, star fighters, and space buggies. 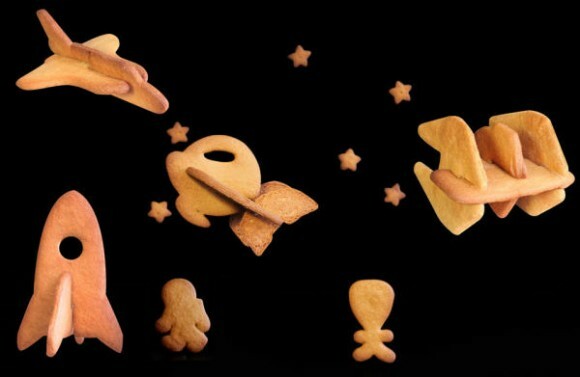 The rocket cookie cutters even come with star, astronaut, and alien shapes as well, to help you play with your food to best effect. Just imagine the icing possibilities! The company also has 3D dinosaur cookie cutters, including a Tyrannosaurus Rex and Stegosaurus. Now if only one of the ships offered was Serenity, we could reenact the first episode of Firefly with gingerbread. Each ship comes separately, at $12 a ship, and can be purchased at SuckUK. Check out more photos of the cookies and cookie cutters after the jump. If you have pictures of the Space Shuttle Enterprise, The Intrepid, Sea, Space & Air Museum would like to talk to you. Well, not so much talk to you as just have you tweet at them, but still -- the Intrepid Museum wants to you to communicate with them, because they want to use your pictures of the shuttle in a new exhibit. 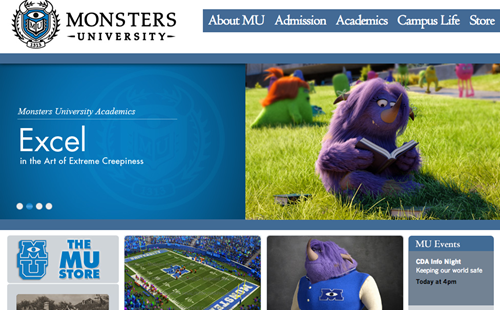 This is a wonderful mash-up relevant to my interests! 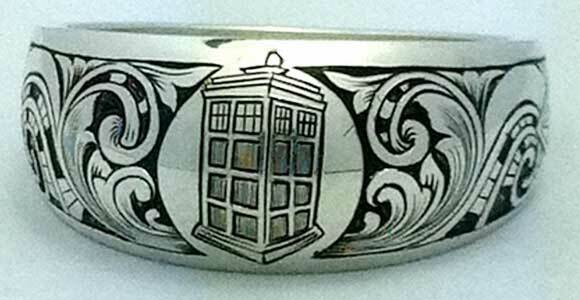 Harpuahound from the online community Engraver’s Cafe, created a unique science and science fiction-minded ring on request. Hit the jump to check out the side views! While there is plenty of high-quality footage showing the drama of a Space Shuttle liftoff, less attention has been paid to recreating the experience of witnessing the event first hand. YouTube user Indiegun spliced together the best blastoff footage around, and then went the extra mile by optimizing the audio to give viewers the stomach-vibrating feeling of being near a rocket launch. Indiegun says that the goal was to share the experience of watching a Shuttle launch to those who could never see it first hand. On our behalf: Thanks. Entering their final phase of retirement, there's been a flurry of activity with the Space Shuttles these past few days. First, Discovery was flown to Washington, D.C. where it was enshrined by the Smithsonian. In doing so, it took the place of the Enterprise -- which was technically the first Shuttle ever built. 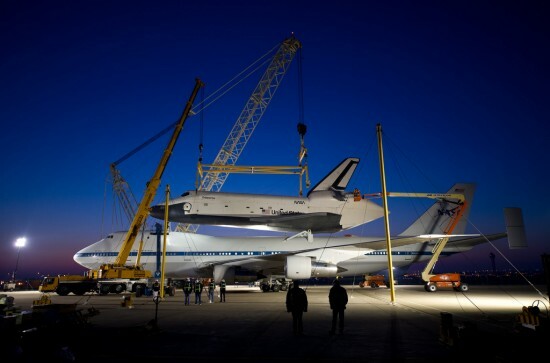 Though it never went to space, Enterprise will take its first ride since arriving in D.C. back in 1985 when it is flown to New York City on Monday. Space shuttle Discovery took off from Kennedy Space Center in Florida on the 12th mission of the shuttle program on August 30, 1984. 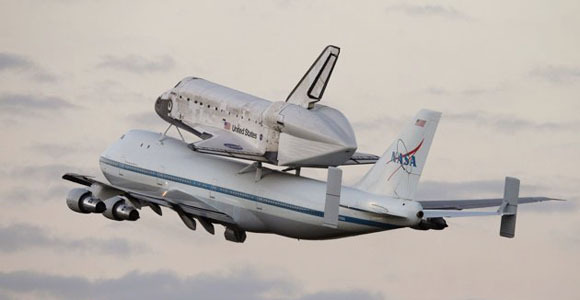 It landed for the last time on March 9, 2011 on what marked the 133rd NASA shuttle mission. Today marks another momentous occasion for Discovery, it took its final trip into our atmosphere with a little help from a friend. If you happen to be hanging around the nation's capital on Tuesday, April 17 between, say, 10 and 11 A.M., you might want to look up because you might miss the last time Space Shuttle Discovery is in the air. It won't be under its own power of course, but strapped to the back of a modified Boeing 747 headed towards Dulles International Airport. Which, actually, might be just a but cooler than seeing the Shuttle by itself. We've already seen a host of objects hoisted high above the earth with the aid of weather balloons, but Romanian YouTube user vinciverse did something a little different. Aiming to create a tribute to the now-retired Space Shuttle, he built his own shuttle out of LEGOs and sent it to the edge of space with a weather balloon. In the proud tradition of B movie makers, the shuttle is suspended in front of a camera with fishing line. While the LEGO shuttle will never make it to orbit, it's a remarkable statement about the Shuttle's importance as a symbol to people all over the world. 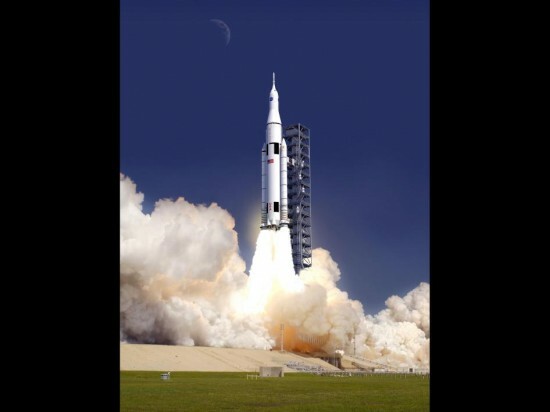 NASA has just announced its next development project: The Space Launch System (SLS). SLS will provide NASA with heavy-lift capability the likes of which it has never previously seen. To boot, the development of the new rockets will likely include re-purposed shuttle material, making this project particularly cost effective. The project aims not only to replace the Shuttle program with a sustainable alternative, but also to considerably improve the distance mankind can reach into the abyss. The SLS rockets will be able to carry the Orion Multi-Purpose Crew Vehicle and other types of cargo into orbit with relative ease. Powered by liquid oxygen and liquid hydrogen fuel, a Space Shuttle RS-25D/E engine for the core stage and a J-2X engine for the upper stage, the SLS rocket should be able to put out a base lift capacity of 70 metric tons, upgradable to 130, beating out the Saturn V which topped out around 118. On February 1, 2003, people around the world watching the Space Shuttle Columbia return to earth were horrified as the shuttle broke-up on re-entry. All seven astronauts onboard were killed, and the remains of the shuttle left a trail of debris from North Texas to Louisiana. NASA immediately set about the daunting task of recovering the pieces of the Space Shuttle, and have continued to do so as pieces are unearthed. The recent drought in Texas has caused water levels to drop across the state, which has revealed a piece of American history resting on the bottom of lake. In the East Texas city of Nacogdoches, NASA has confirmed that a part of Columbia has been discovered. 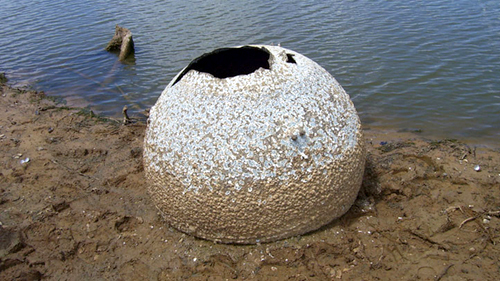 The piece of debris is a power reactant storage and distribution system (PRSD), which looks like a badly battered disco ball. 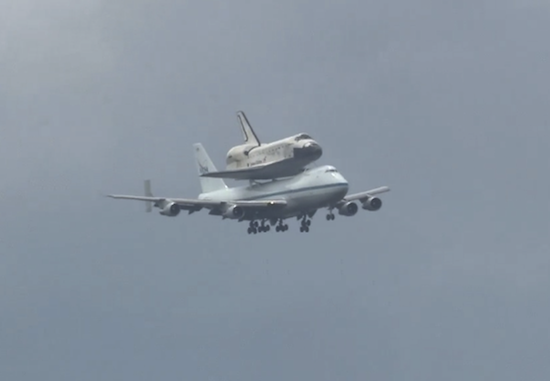 The Space Shuttle Atlantis, which launched July 8th, has returned to Earth. Atlantis' safe return marks the end of an era, as it is the official conclusion to the entire space shuttle program. Atlantis and her four person crew commenced their landing at night, and touched down at NASA's Kennedy Space Center at an official full wheel stop time of 5:57am. It was NASA's 25th night landing, the 78th landing at Kennedy Space Center, and the 133rd landing in overall shuttle history. During this mission, STS 135, Atlantis orbited Earth 200 times and flew 5,284,862 miles. STS 135 was Atlantis' 33rd and final mission. In the course of shuttle's history, Atlantis spent 307 days in space, orbited the Earth 4,848 times, and flew 125,935,769 miles. The space shuttle program is now officially over and the future of NASA and American space exploration, though sure to continue, is uncertain. You've seen the International Space Station and the Space Shuttle as they transit across the sun, and you may have seen them from a soyuz spaceship, but you probably haven't seen them from Earth in broad daylight. 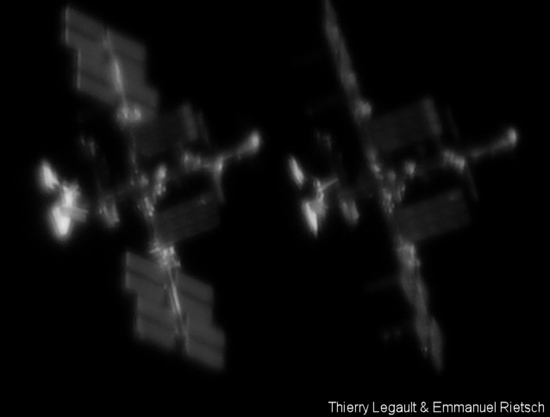 Using only an eight-inch telescope and a video camera, astronomer Scott Ferguson was able to capture images of the ISS with the docked Atlantis orbiter over an hour after sunrise. His only trick, besides experience in astrophotograpy, was specialized software to predict the position of the space station -- important when the subject of your photograph is orbiting 210 miles above you. 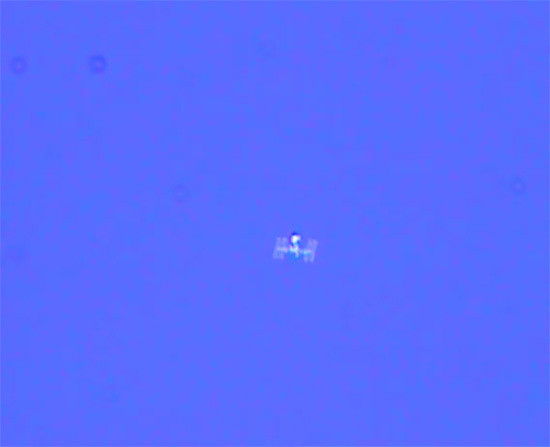 Though Ferguson's video is certainly impressive, the Bad Astronomy blog claims that because of the space station's 300 foot span it can be spotted with binoculars. You won't see any detail, just an elongated point that, clearly, is not a star or a planet. But that aside, kudos to Ferguson for his incredible video. See it for yourself, after the break. 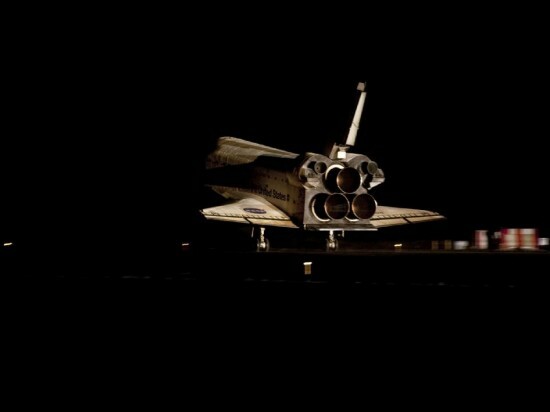 When it was announced that the retired Space Shuttles would be put on display at museums across America, it was a sweet follow-up to the sad news that the whole program would be retired. But The Universe Today's set of pictures showing Space Shuttle Discovery stripped down, looking sad and forlorn as it was towed to the Vertical Assembly Building is a painful price. In preparation to becoming museum pieces, the Shuttles will have their engines removed -- the three main engines in the back, and the maneuvering thrusters in the nose. The shuttles will also be thoroughly cleaned to get rid of any of the toxic chemicals. The result is a rather sad looking ship, far from the powerful vehicle that flew to space and back so many times. With its windows covered up like that, I can't help but feel like Discovery has had its eyes poked out. 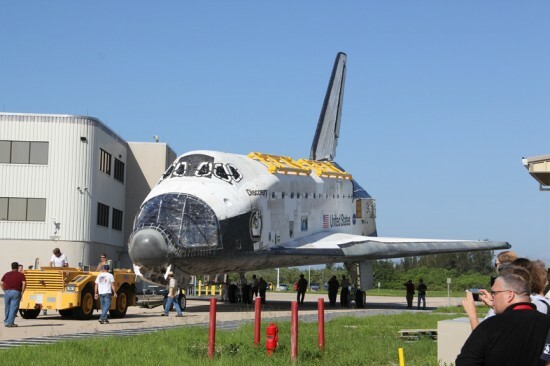 Hopefully the Shuttles will look a bit less pitiful when the decommissioning process is complete. Read on below for more images of Discovery, which may or may not tug at your heartstrings. Chris Bray and father Kenneth attended the first Space Shuttle launch thirty years ago (left) and have now attended the last Shuttle launch four days ago (right). Funnily enough, even though they seem like superfans, the first and last launch were the only two they attended, deciding to bookend the Shuttle program by managing to attend the last launch. We generally enjoy the "Young Me Now Me" meme, but there's something special about the Bray duo's attempt, in that it represents the somber end to the Shuttle program. Space Shuttle Atlantis is set to launch not too long from now on the last-ever Shuttle mission of the 30-year-old American program. The launch is currently scheduled for 11:26 a.m. EST, taking off from Cape Canaveral, Florida at Kennedy Space Center. You can watch the stream above, or over on NASA TV. NASA is prepping for the very last flight of the Space Shuttle Atlantis, which will mark the end of the entire Space Shuttle program this week. 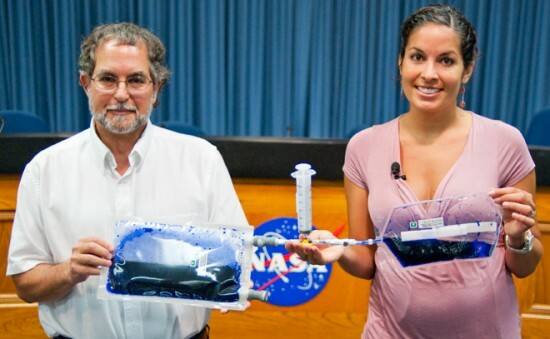 The crew of Atlantis will conduct a range of scientific experiments, among them (and most notable for the ew-factor) is a baggie-based urine recycling system that may make pee drinkable. Yes, that refreshing beverage, pee. But before you become completely repulsed, rest assured the astronauts themselves will not be drinking urine. At least not these astronauts, not yet. The test will be conducted with an experimental fluid, to test the ability of established pee recycling systems to work in space. The military already uses a similar technology to filter parasites, bacteria, and viruses out of dirty fluids (including urine) for sanitary reasons. The final Space Shuttle mission planned for next month will have a unique twist: the shuttle will carry two Apple iPhone 4s to the ISS for a series of experiments using the SpaceLab app. The app, currently available in the app store, was created by Odyssey Space Research and aims to carry out positioning and other experiments with the phone. Though not mission-critical, and no doubt somewhat aggrandizing, the experiments will help improve SpaceLab and maybe open the possibility for similar functions on handheld devices in space. Once in orbit, the ISS crew will test SpaceLab's ability to determine altitude and position. Amazingly, the app can apparently do all of this without a data connection, instead using a sequence of images taken with the iPhone's camera as a reference and performing the calculations internally. The lack of wireless functionality is partly due to NASA's concerns about the phone's electronics interfering with station functions. The ISS crew will also calibrate some of the app's senors, and the app itself will monitor the effects of radiation on the device by watching for blips on the phone's memory during orbit.